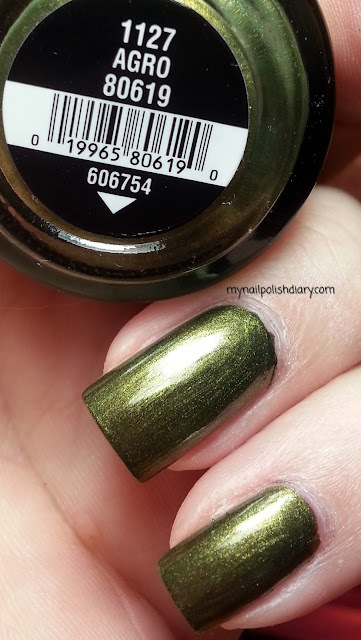 China Glaze Agro was released in the spring 2012 Capital Colors collection coinciding with the release of the first Hunger Games movie. DH and I went to the midnight showing at the IMAX. It was a great time and I did a really fun mani that night, but took less than stellar pics as an afterthought at the theater. *shrug* I'm just glad I thought to take them at all with all the excitement that night. 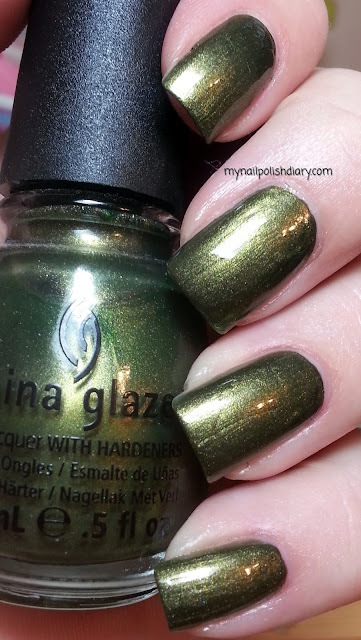 China Glaze Agro is perfect for this time of year. For me it's one of those polishes as I color I might not really love but looks so awesome as polish. I really enjoy wearing this shade. It's olive green with gold shimmer. The polish formula is perfect and it applies so smooth. I had zero problems and didn't even have to do any clean up. It wears good too. This is a fun mani.